Habitat: Open fields, roadsides. Anywhere with lots of sun. Description: A very common plant. This pea family member has round, composite, whitish flowers and triangular compound leaves with three leaflets bearing white triangular marks called chevrons. 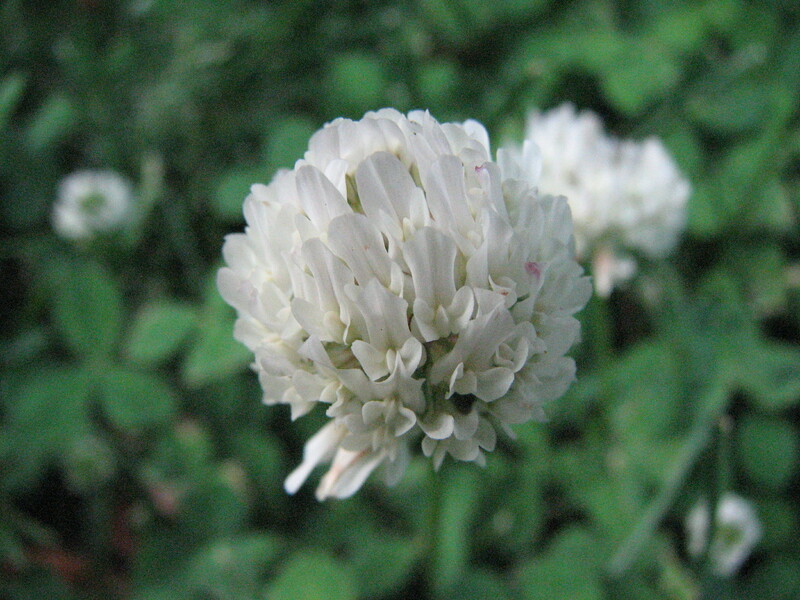 Unlike its brother, the Red Clover, this plant does not get nay hairs on its leaves or stems. Edibility: The flowers can be eaten raw in salads or cooked into various foods (breads, muffins, etc.). They can also be batter dipped and fried for an excellent snack. The leaves can be eatern raw as well. However, this plant is very high in nitrogen which, if eaten in quantity, can cause cramps. Cooking may lessen this effect. The flowers can be dried for tea. When drying any part of this plant be alert for mold growth and discard if any mold is present. Faster drying will help to prevent molding. Other Notes: As a member of the pea family (leguminosae), this plant contains nitrogen fixing bacteria in its roots.